"You clean Patricia Dreher's paintings with a mop: they're canvas rugs. The Berkeley-based artist uses acrylic paints on sturdy artist's canvas and seals the designs with several coats of water-based polyurethane. She makes area rugs and larger rugs for wall-to-wall installations. You can lay the painted canvas directly on the floor (with or without a pad) or glue it down like vinyl flooring. Most of Dreher's paintings are non-representational and combine geometric shapes and muted colors, but she will include narrative images on request. She tailors each design to its setting. 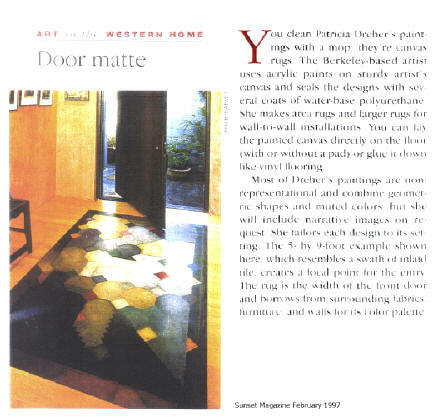 The 5- by 9-foot example shown here, which resembles a swath of inlaid tile, creates a focal point for the entry. The rug is the width of the front door and borrows from surrounding fabrics, furniture, and walls for its color palette."